Ganzan-daisi-do enshrines Jie-daishi (Great Teacher Jie). 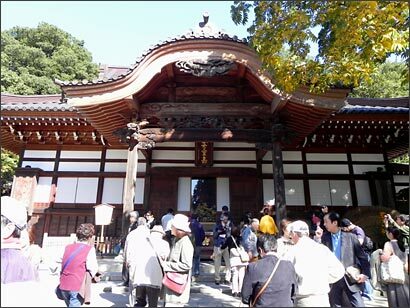 Jie-daishi was highly popular in the Edo Period and when Jindaiji was burnt down in 1865, Ganzan-daishi-do was reconstructed only two years later in 1867 thanks to the donation of the enthusiastic worshippers. 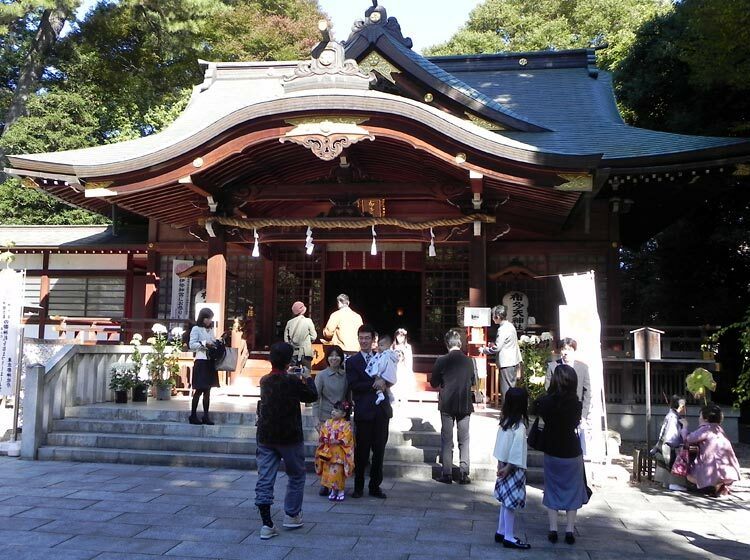 Jindaiji is the second oldest temple in Tokyo after Sensoji in Asakusa. According to the oral tradition, the temple was established in 733 by Saint Mankuh. This name Mankuh does not sound Japanese and in fact Mankuh is believed to be a descendent from Goguryeo, an ancient Korean kingdom (BC 37- AD668) - Check this page!. A legend tells that his father Fukuman could marry a daughter of a powerful local family, because Fukuman, with the help of Deva Jinja, water divine, could ride on the back of a heavenly tortoise and land an isolated isle in a lake where the beloved girl was confined by her parents. 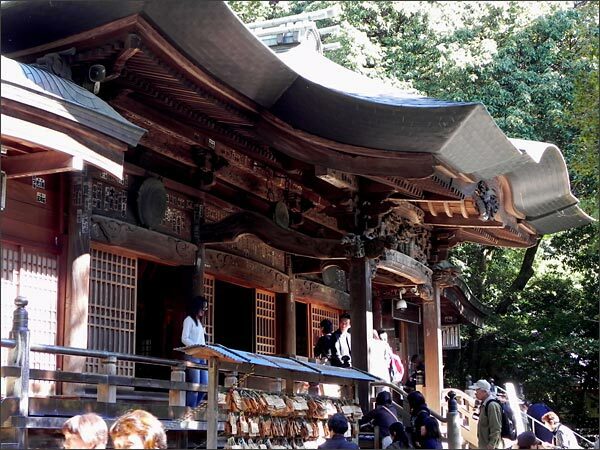 The name "Jindaiji" comes from "Deva Jinja" and the temple is closely related to Deva Jinja. The oldest construction is this straw thatched Sanmon. Not far from Jindaiji there exists Kohaku-jinja and "haku" of "Kohaku" means Goguryeo. Kohaku-jinja was founded in 539 according to the record of the shrine. 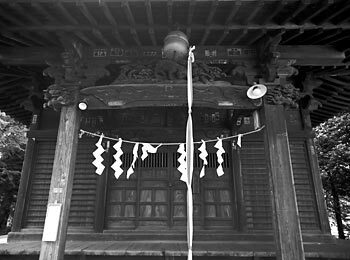 Though the year 539 is not much reliable, Kohaku-jinja was enlisted in the most formal list of shrines of Engi-shiki in 927. Therefore, the origin of the shrine is old anyhow. Most probably Kohaku-jinja was established as communal shrine of a Goguryeo colony. Mankuh is believed to have established another temple Giohji. It is interesting to note that Giohji has an additional name "Kohaku-san" (Mount Kohaku). The custom to use an additional name to the temple name using "-san" comes from China and it usually refers to the place where the relevant temple is built. 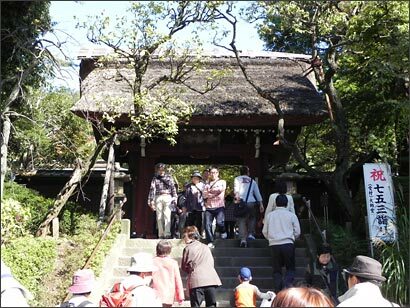 However, "Kohaku" is not a place name, but the name of the nearby shrine which I mentioned above. It is said that Mankuh was born where Giohji now exists, because the Nukui clan, the family of Mankuh's mother, were powerful till the mediaeval time and had their residence around here. 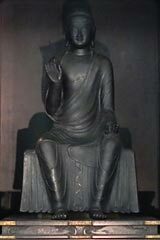 In 1907 a bronze Buddha statue was discovered from beneath the platform of a main building. It was apparently made in the end of the seventh century, before the establishment of Jindaiji, and its style is similar to Buddha statues in Silla. Everybody believes that such a refined figure cannot have been made in this region. However, no information is available concerning the relations to Yamato where such a statute could have been made. Together with the date of its making, the Buddha is full of mystery. I want to suppose the relations to Goguryeo or other continental sources. Jindaiji, Kohaku-jinja as well as Giohji belonged to Komae County in the ancient time and Komae was a center of Goguryeo immigrants in the Kanto area maybe already before the Emperor's government integrated the area into its state system. Therefore it is not strange that important religious institutions were first established by Goguryeo immigrants. People are queuing in front of a soba restaurant. On the way back from "Shichigosan" shrine visit? 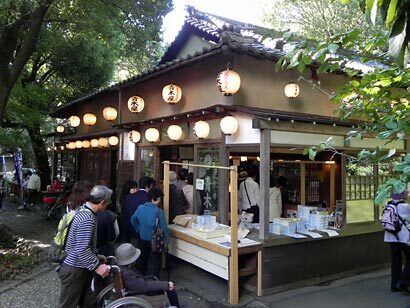 Jindaiji is first and foremost popular among people because of its soba. 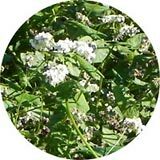 Buckwheat is also believed to have been introduced by Goguryeo people. 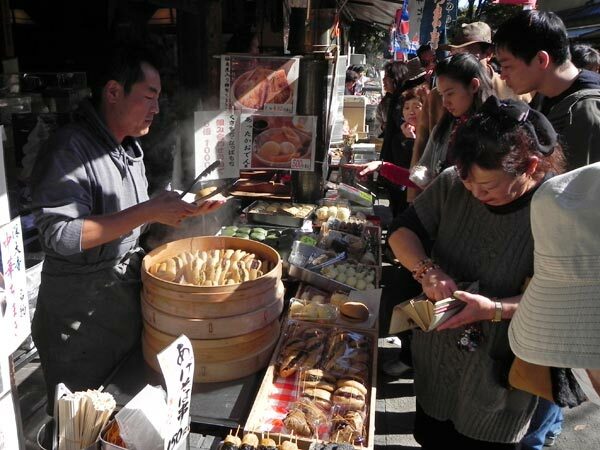 The soba noodle of Jindaiji won particular popularity in the Edo Period because Jindaiji soba was favored by Shogun. Unfortunately, I do not find the present Jindaiji soba especially delicious. Some people might say that I draw a hasty conclusion, as there are a few dozens of soba restaurants and I know only a few of them. However, there is a saying in Japan "No well-known local specialties taste well" and many of my friends believe that this can apply to Jindaiji soba. 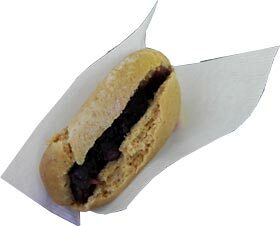 Though soba noodle tasted only average, steamed buckwheat bread with the filling of sweet red bean paste was delicious. There were several other kinds of filling such as pumpkin jam. In front of the sweets shop there is a pond modeling the lake which hindered Fukuman to meet his adored girl. 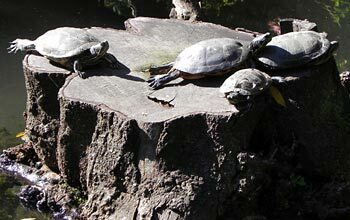 Ordinary tortoises climbed up stumps or tiny isles and relaxed themselves under sunshine. Recently Chofu, the municipality where Jindaiji is located, became famous because of an early-morning TV drama series: a drama featuring the wife of a famous spirit-monster manga artist Mizuki Shigeru. The figures of his manga "GeGeGe no Kitaro"
decorated a pedestrian way near Chofu station. 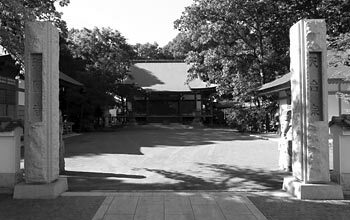 Some scenes of the drama were also taken in Jindaiji. 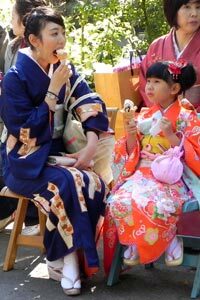 It was therefore very natural that the number of visitors was especially large on a sunny holiday. I thought first that the crowd was created because of Sichigosann, as November is the month when parents take their 7 years, 5 years and 3 years children to shrines and temples to prey for their health. But, that was only a part of the cause.